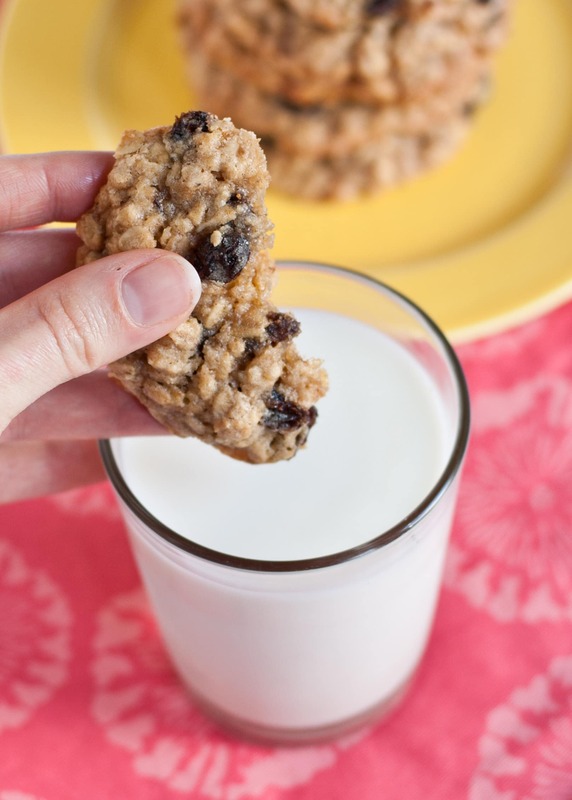 Today I’m sharing my take on the classic Oatmeal Raisin Cookie. Today for #SundaySupper we’re honoring the fathers in our lives. Whether they earned the title by blood or by loyalty or by years of distilled wisdom we’re honoring the ones who have guided us, helped us, and shaped us into the people we are today. My dad has never been one for the lime light. You’re much more likely to find him in the back fixing an electrical shortage than on a stage. Dad’s the one in the backyard, manning the grill, making sure your steaks turn out just right. He’s the one tucked under the hood of a car hooking up jumper cables because his darling daughter can’t remember to turn her lights off. He’s the one hanging lights, building closets, doing the dirty work no one else seems to want to do. And he’s doing it all quietly, without fanfare, without attention, and all too often, without thanks. My dad isn’t the extravagant type. He doesn’t express his love in giant bouquets or strings of diamonds. Instead, he lives it, every day, with thoughtful, generous gifts of time and service. I credit my dad with teaching me that kind of love. The kind of love that doesn’t have to be loud or showy, but instead proves itself with quiet, faithful devotion over the long haul. It’s the kind of dependable, constant love you know you can count on when you’re stranded on the road at one in the morning. It’s the kind of love that will show up to watch you play Laurie in Oklahoma three nights in a row, even though you know he doesn’t really like musicals. it’s the kind of love that sits patiently beside you, not acting a bit terrified, as you make your first shaky, jumpy drive around the block. For so many reasons, these oatmeal raisin cookies remind me of my dad. I don’t know if they’re his favorite dessert–he does love a good crazy cake or Crisco cookie–but I do know they’re way up there at the top. I’ve always thought it was fitting that dad would choose the humble oatmeal raisin cookie over it’s famous cousin, chocolate chip. Like dad, the oatmeal raisin cookie doesn’t get a lot of attention. It’s not paraded on blogs, featured on the covers of cookbooks, or raved about in cafes. But the oatmeal raisin cookie is the kind of cookie you can depend on. It’s comforting and homey. It’s sturdier than a chocolate chip cookie and feels like it would hold up better under pressure. It’s the cookie of lunch bags and after school snacks. The cookie you find nestled in a jar on the counter, there for you if you need a quick breakfast or a late night nibble. It’s just like dad– faithful, comforting, humble, good. I feel a little bit embarrassed that it’s taken me this long to share my favorite oatmeal raisin cookie with you all. 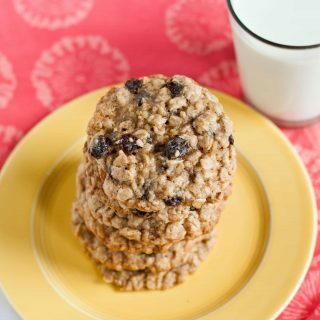 There are so many different recipes for oatmeal raisin cookies–some cakey with just a little oats, others packed with ginger or nutmeg, others crisp and buttery thin little wafers. 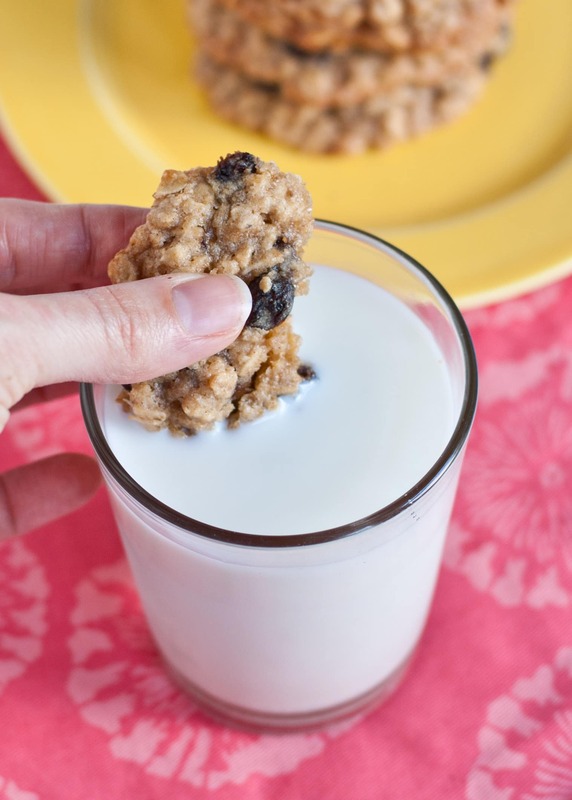 Truthfully, I like these cookies every which way, but this seems to be the recipe I return to most often for a classic, chewy oatmeal cookie. This one is made with old fashioned rolled oats so it retains that addictive crisp-chewy, hearty texture. Lightly spiced with cinnamon, the smell of these cookies will draw people to the kitchen like moths to a porch light. I like to add pecans to them, but they’re good just as plain as can be, too. Like most of my cookies, I have three recommendations for these: underbake, underbake, and omg you should really take these out before they’re totally done! If you want to retain that crisp outside and gooey center, take these out just when the perimeter is set then allow them to finish setting up on the baking pans. Wait that excruciating five minutes for them to set up then scoop them straight from the hot pan and dunk them right in a big glass of ice cold milk. There’s not a more satisfying or comforting treat out there. I’m convinced. Note: I've made these with regular large eggs before and they turn out just fine. The extra large makes them just a tad more moist. You can use dark brown or light brown sugar. Preheat the oven to 350 degrees. If you'd like to add pecans, spread them out on a baking sheet and bake for 5 minutes. 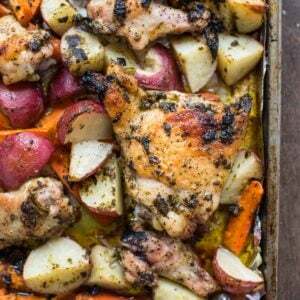 Remove from oven, cool, then coarsely chop. 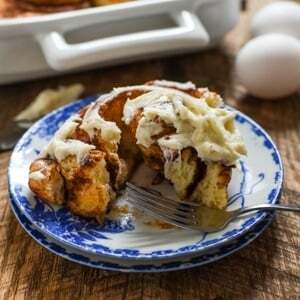 In a small mixing bowl, whisk together flour, baking powder, cinnamon, and salt. Set aside. In the bowl of an electric mixer, beat butter and sugar on medium high speed until light and fluffy, scraping the bowl down as needed. Add eggs, one at a time, beating well after each addition. Beat in vanilla. With the mixer on low speed, slowly add flour mixture to egg mixture. Beat until well combined. Add the oats, drained raisins, and pecans (if desired) and stir to combine. Drop about 2 inch rounds of dough onto sheet pans lined with parchment paper. Flatten slightly with the palm of your hand. These don't spread too much so you'll only need an inch and a half or so between cookies. Bake for 12-15 minutes or until golden and set on the outside and still a little gooey on the inside. Remove from oven and allow cookies to set up on the baking sheet for 5-10 minutes. Then remove to a cooling rack to cool completely. I have those moments with my husband as well. It’s so fun to discover new things after several years together! Your cookies look wonderful! I haven’t made or had a good oatmeal raisin cookie in forever! Great recipe! I know. They’re one of those cookies you kind of forget about until you have a really good one again! Then I can’t stop thinking about them! Homemade oatmeal raisin cookies are in my top 5 favorite things. Yours look perfect! Your post brought tears to my eyes because it describes how my dad was to a “T”. He taught me the same as your dad in so many ways. 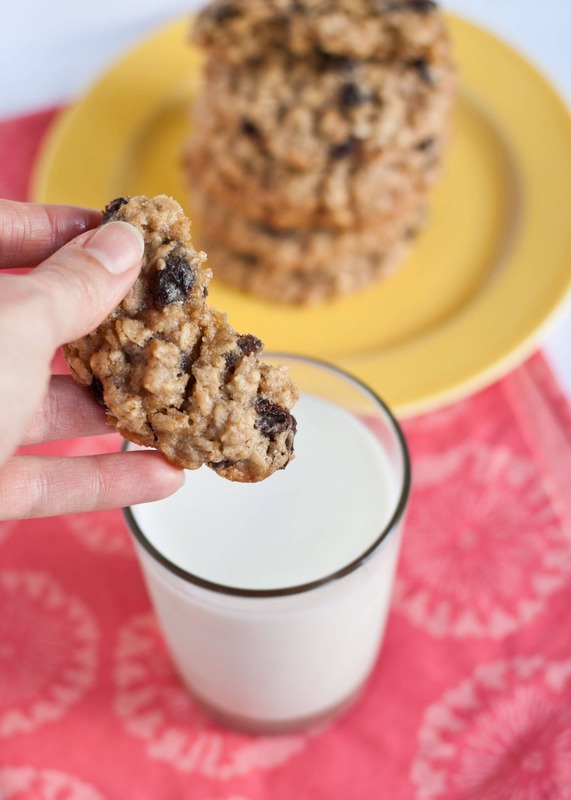 And although oatmeal cookies don’t get much fanfare, they certainly are one of the best. Thanks Renee. It’s hard to express that kind of love in words, but I’m glad it touched your heart. Dads are the best! 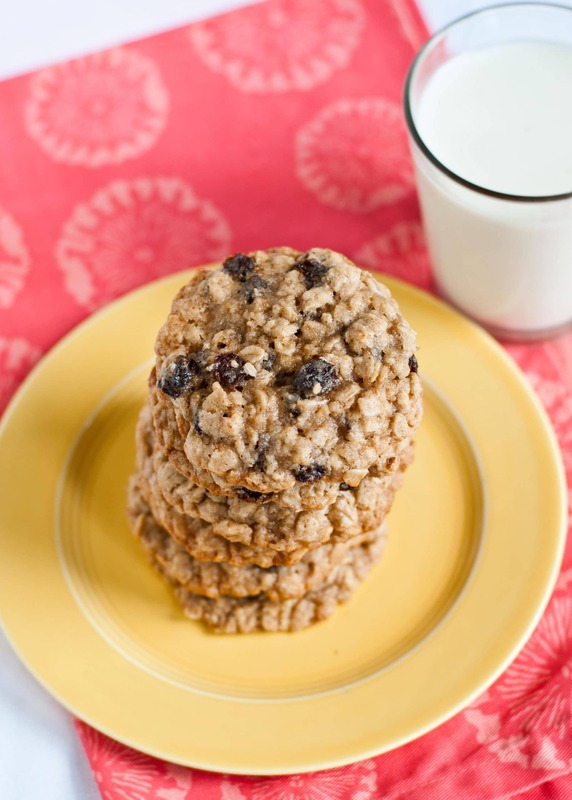 You’re right – Oatmeal Raisin are not the most glamorous cookie, but they are so comforting. I remember when I asked my mother in law about her favorite cookie, and she told me Oatmeal Raisin, I was like “what?? really? those?” But now I make them for her every year on her birthday. I’ve been using Martha Stewart’s recipe, but sometimes those spread out more than I like them too. Yours look more chunky and chewy, which is what I want. I’ll pin these and make these ones this year! Thanks! These are definitely both chunky and chewy! Win! Thanks so much. You’re so right. It is the small acts of love and generosity that matter most. Perfection and then dipping it in milk even better!! Love your post and your recipe!! Thanks Soni! They are perfect warm and then dunked in milk! I just LOVE oatmeal raisin cookies. They are such a classic, and yours look like perfection. Thanks Isabel! I’m glad there are some fellow oatmeal raisin cookie lovers out there! Oatmeal raisin cookies are definitely one of my favorite. These look so soft and chewy! I’m always looking for a good oatmeal cookie! Thanks! Oatmeal raisin cookies are coincidentally my dad’s favorite cookie! I love them too – chewy and yummy! Courtney, what an amazing tribute to your father. I really love how you described him – so stoic, so silent, but always there, always doing what needs to be done, and showing his love through actions. You’re totally right about the noble oatmeal raisin cookie – dependable and sturdy, just like dad. I’m definitely going to try these – thanks for sharing your thoughts and the recipe! Great tribute to your father! Oatmeal cookies rock! My favorite kind of cookie! Can’t wait to try your recipe! These are my brother’s favorite cookies, so I made them today for his birthday. They are delicious, and I completely agree with the importance of underbaking them and then letting them sit and bake out of the oven on the pan the last few minutes. They make a moist, extremely flavorful cookie. I always know to come to your blog when I need a good cookie recipe. These are the bomb! Thanks for coming by to comment Katie! I’m so glad you all liked them! It’s amazing what a difference underbaking makes!